The Forum Shops at Caesars has long been noted for its eclectic collection of restaurants and unique eating options in addition to its plentiful roster of renowned retailers from around the world. With an array of distinct dining experiences to choose from, there’s something for every taste this month at The Forum Shops. WHAT’S CRACKIN’ AT JOE’S STONE CRAB THIS SUMMER: Defined by a standard of hospitality and style born in the early 1900s, Joe’s offers a dining experience that is both comfortable and timeless. Located in the heart of Las Vegas on the Strip, Joe’s continues the legacy that began in Miami inside the Forum Shops at Caesars Palace. Upon entering the multi-level restaurant, guests are welcomed by friendly tuxedo-clad staff, and every guest is sure to receive the kind of warm reception and caring service that has defined Joe’s for nearly a century. The vast dining room boasts mahogany paneling, crisp tablecloths and elegant chandeliers creating a classic ambiance. The large and inviting full-service bar is an intimate, laid-back area filled with tall boy tables and comfortable bar stools - the perfect place for sipping on cocktails, taking in the big game or catching up with friends over a delicious bite. Looking to grab a quick lunch? Feast on all your favorite dishes in the café which is set in the lively Forum Shops. As Las Vegas’ premier dining destination for prime steaks, the freshest seafood and world renowned Florida Stone Crab claws, Joe’s Stone Crab’s distinctive cuisine is nationally acclaimed. Their bone-in signature steaks are hand-carved by master butchers and prized for their rich, on-the-bone flavor and tenderness. Joe’s is famous for Stone Crab claws, which are flown in from their fisheries in Florida and served cracked with a savory mustard sauce. That’s not all, Joe’s offers a wide variety of other seafood dishes including Wild Alaskan Salmon and Madagascar Shrimp, among many others, as well as favorites such as Joe’s famous Fried Chicken, classic Grilled Cheeseburger and Vegetable Chopped Salad, to name just a few. Sides like Jennie’s Mashed Potatoes, Grilled Tomatoes and Garlic Creamed Spinach are the perfect complement to any meal. For dessert, Joe’s offers an array of homemade pies ranging from their signature Key Lime Pie to classics like Banana Cream Pie with Foster Sauce. Whether you’re delighting in a night on the town, in-between a winning hand at the black jack table or simply want to enjoy a great meal, Joe’s Stone Crab provides the ideal setting. For more information or to make a reservation, please visit www.joes.net/las-vegas or call 702-792-9222. BOA Steakhouse retains the finer qualities of the traditional American steakhouse, while boldly repackaging the concept with a sleek, modern design and a contemporary menu. Its menu celebrates twists on classics and more than one dozen ways to dress the signature prime steaks. For more than 30 years The Cheesecake Factory has served more than just delicious food and cheesecakes, they helped their guests share lasting memories with family and friends. The Cheesecake Factory menu boasts more than 200 menu selections made fresh from scratch each day. Hours: Mon. through Thurs., 11:10 a.m. to 11:30 p.m., Fri. 11:10 a.m. to 12:30 a.m., Sat. 10:10 a.m. to 12:30 a.m., Sun. 10:10 a.m. to 11:30 p.m. Hours: Daily for lunch at 12 p.m., open nightly for dinner starting at 5 p.m. Closed Sundays. Joe’s Stone Crab serves freshly cracked Florida Stone Crab Claws with its signature creamy mustard sauce. The menu also showcases fresh seafood flown in daily from around the world, including seasonal specialties such as Madagascar Shrimp, Nantucket Cape Scallops, fresh Alaskan King Crab and Copper River Salmon. A meal at Joe’s Stone Crab would not be complete without a slice of its world-famous signature Key Lime Pie. The Southwest is famous for its Mexican restaurants, and La Salsa Cantina is superb, serving freshly-prepared, gourmet Mexican food. Also try the award-winning margaritas, featuring the original La Salsa Margarita by the Yard. Hours: Mon. through Thurs., 11 a.m. to 11 p.m., Fri. through Sat., 11 a.m. to 12 a.m., Sun., 11 a.m. to 11 p.m. Hours: Sun. through Thurs., 10 a.m. to 11:30 p.m., Fri. and Sat., 10 a.m. to 12:30 a.m.
After 125 years, New York’s most spirited bar and eatery, P.J. 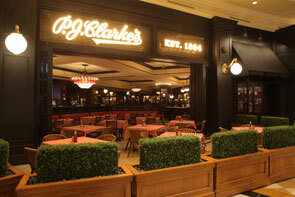 Clarke’s opens its first West Coast location at The Forum Shops at Caesars. A landmark watering hole in the Big Apple, the eatery and saloon has been known for decades for its ambience and the high quality of the food served simply. Featuring timeless American fare, classic burgers, and bourbon, expect a raw bar with shrimp, lobster, oysters and Long Island clams on the half shell, chicken pot pie, fish and chips, baked macaroni and cheese with peas and bacon and Mile High Shrimp sandwiches. And of course, Meyer beef from Montana’s Blackfoot River Valley, P.J. Clarke’s only supplier for its steaks and famous hamburgers. Hours: Daily from 11 a.m. to midnight. It is the dining experience inspired by the glamour and excitement of the big screen. Planet Hollywood offers an extensive Hollywood memorabilia collection featuring props from blockbuster movies and classic TV shows, while the diverse menu offers guests’ favorites. Exotic salads and award-winning burgers are only a few of the many signature flavors guests find, in addition to taking home a piece of Hollywood with the latest fashions and collectible souvenir gifts. Hours: Sun. through Thurs., 9 a.m. to 11:30 p.m., Fri. through Sat., 9 a.m. to 12 a.m. Hours: Sun. through Thurs., 12 p.m. to 10 p.m., Fri. and Sat., 12 p.m. to 11 p.m.
For over 80 years, The Palm has been serving USDA Prime Aged Steaks, Jumbo Nova Scotia Lobsters, the freshest available Palm Fish and their own heritage Italian cuisine in a remarkable atmosphere of warm, genuine hospitality. The Palm is more than a restaurant… it’s a unique experience. Elegant private dining rooms are available for all special events. Hours: Mon. through Sun., 11:30 a.m. to 11 p.m.
Trevi Italian Restaurant is named after the most famous fountain in the world located in Italy. Trevi creates an Italian Brasserie that transports guests to the piazzas and streets of Rome. The restaurant features café dining with elaborate street lamps surrounding a fountain and walk-up gelato/espresso bar. Hours: Mon. through Thurs., 11 a.m. to 12 a.m., Fri. and Sat., 11 a.m. to 1 a.m., Sun., 11 a.m. to midnight.